The parliamentary elections of June 28 created a strange situation in Albania. 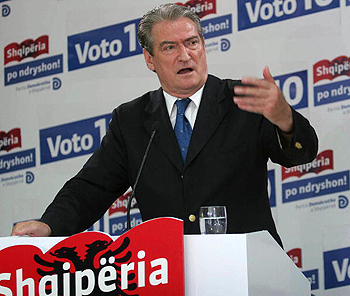 The Democratic Party, who won the elections, formed a new government this month headed by Sali Berisha, but the opposition is not taking part in the parliamentary sessions. The economic situation is not good, with the Albanian currency rapidly losing points against the Euro and rows of unemployed growing. The government predicted some months ago a G.D.P. growth by more than 6 percent, which would be the largest in Europe this year, but that is unlikely to come. I.M.F. experts have predicted a growth of no more than 1 percent. During the months prior to the election campaign, the government made huge public investments that gave the illusion of growing G.D.P. and a healthy economy. But the last data by the Institute of Statistics showed that industrial production has fallen by more than 23 percent. In this situation the opposition is looking forward to premature elections while the Democratic Party in majority pledges to integrate the country into the E.U. in the next four to six years. A recent report by OSCE-ODIHR, which monitored the elections in Albania, said that on June 28 the country made great steps forward. "The parliamentary elections marked tangible progress with regard to the voter registration and identification process, the legal framework adopted in a consensual manner by the two main parties, the voting, counting and the adjudication of election disputes." But there were problems, too. The main problem of the elections was political. The report continued, "These substantial improvements were overshadowed by the politicization of technical aspects of the process, including during the vote count and tabulation, which temporarily blocked the counting process in some areas, as well as by violations observed during the election campaign." These are bitter words for the Albanian political scene but there's nothing new in them. The Central Elections Commission is elected by the political parties in the Parliament; the persons who count the votes are elected by the political parties; and the ballot boxes were located in dubious places like coffeehouses and private shops. Considering these facts there's no surprise that the elections were overshadowed by the politics. The counting process was monitored by camera, but the small parties that were left out of the parliament said that their votes were stolen. The same statement was made by the Socialist Party, too, which claimed the elections were stolen. The new government was approved by the Parliament on September 16. It promises big reforms, as always, but its composition leaves some doubts. Two of its 15 ministers are accused by the General Prosecution of corruption and have open processes in the Court. In the last 10 years a lot of accusations have been made for corruptions, but no high official has ever been sentenced to prison. Theses cases should prove no different. The judicial system is the most flawed in the country. It aims to fight corruption but is repeatedly marked as the most corrupt in Albania. Earlier this year, just prior to the elections, Albania applied for E.U. membership. This was a big step forward for a troublesome country. The application has yet to be considered by the European Union but the result is likely to be positive. However, Albania was not part of the Balkan countries that profited visa liberalization with the E.U. The cause: no reforms. In this situation, premature elections would be a heavy blow for the European aspirations of the country. But the political situation is severe. The opposition calls the new government illegal and demands recounting of votes in some areas. The OSCE-ODIHR report said that the counting process was flawed in one out of three cases. This obviously leaves doubts as to the accuracy of the election results. The margin of victory was so narrow that even small counting problems could have made the difference. It's hard to predict the near political future of the country. There is no doubt that the new government will have a difficult road ahead. Important laws soon have to be approved in the Parliament, but they need 84 votes, which the majority in the Parliament has not. Oppositions' absence could have future European implications for the country. The foreign presence in Albania has repeatedly asked the Socialist Party to be part of the new Parliament. Democratic debates are made inside the institutions, said the head of the European Commission delegation in Tirana. Albanian citizens are more concerned about the economy, which is doing badly, even though the government says the contrary. Remittances have fallen the last two years, foreign investments are low, and government spending is huge, leaving a growing deficit behind. The government tends not to make public the real situation of the economy. Almost half of the Albanian economy is informal, which means that the predictions of great G.D.P. growth are flawed. If we consider the words of Nobel Prize-winning economist Joseph Stiglitz, who in an article recently said that G.D.P. is no longer reliable for measuring the economy of a country, then the situation in Albania looks gloomy. Ledion Krisafi is a freelance journalist living in Tirana, Albania.